The annual feast of St. Anne is celebrated at Talawila today. On the narrow tongue of land, known as the Kalpitiya peninsula, lying between the Puttalam lake and the mighty Indian Ocean, nestles the cosy little Talawila, where the famous sanctuary of St. Anne stands. The country around the shrine is a waste of bleak sand, dotted over with copses of low growth and tall palmyrahs, which with their erect, sturdy trunks terminating in a tuft of broad fan shaped leaves, stand challenging the drought and the monsoon blasts. Around the church, however, there is a fair acreage of full-grown coconut palms, like an oasis in a desert, to gladden the pilgrim. Nature has no charms to offer here in spite of the deep blue sea, which is hardly one hundred meters from the church, the climate is hot and enervating. But, year after year, for the last fifteen decades and more, vast crowds of devout pilgrims, drawn from every strata of life and from every corner of the island, have flocked hither. No human power drew them there; no worldly gain nor love of pleasure or profit or fame brought them there. An old fashioned church and in it a rough image of a Saint, who had loved and died even before the birth of Christianity, these have been the attractions. They have come animated by a sense of an unseen, yet real, power; they have come to worship good and honour His saint, to invoke Divine assistance and offer thanks for favours received. 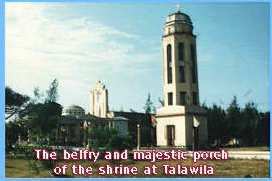 Like all divine works, the shrine of Talawila began in a small way, it developed in spite of difficulties and in hostile surroundings. Then in God's good time and against all human calculations, it sprang to fame as a rallying point of Catholic piety and a great national sanctuary. But, how did it all happen? It is against a background of small beginnings, rapid progress, severe trials and joyous triumphs, that the history of the shrine of St. Anne at Talawila has been silhouetted by written records and authentic traditions. History reveals that Kalpitiya and the district around it nurtured the earliest contacts between Sri Lanka and India. The landing place of Prince Vijaya is just across the lake, a few miles to the north of Puttalam and further north is Kudiramalai, Pliny's Hippuros, once a busy trade centre. Kalpitiya itself was an important port for the trade between Sri Lanka and India and at times, the waters around Kalpitiya ran blood when contending nations fought for the control of sea routes. Christian missionary work began in the peninsula around 1606 and the Fathers of the Society of Jesus from South India were the first to preach the gospel in these parts. However, with the recapture of Negombo by the Dutch shortly after 1944 the Jesuit Fathers had to quit the peninsula and the Catholics of the peninsula were without mass or sacraments or adequate religious instructions for nearly half a century but they remained steadfast in the faith. In 1687, Venerable Father Joseph Vaz (now Blessed Joseph Vaz), an Indian oratorian, taking pity on the deserted flock of Christ in Sri Lanka smuggled himself into Jaffna in the guise of a labourer. He arrived at a time when the Dutch persecution of Catholics was very bitter and when there was a price set on the head of any Catholic priest who might be found in Dutch territory. In spite of incredible hardships, he visited, consoled and ministered to the Catholics in Jaffna and Vanni. In 1690 he came to Puttalam and the presence of a priest just across the water, could not have been long hidden from the afflicted Catholics in the peninsula. In 1705, five new missionaries including Father Jacome Gonsalves arrived in Sri Lanka. But a priest was not always secure at Kalpitiya as long as the Dutch held it but in spite of the danger, the priests continued to minister the Catholics of the peninsula. With the decline of the Sinhalese power and the gradual ascendancy of the Dutch in coastal areas, the obstacles to missionary work increased but the church progressed especially in the king's territory and the Dutch were aware of it. On August 11, 1747 King Śrī Vijaya Raja Sinha died in the prime of life and many other calamities befell the kingdom, which were generally believed to be retribution from heaven for the injustice done to Catholics. At least, so thought his successor, Kirthi Śrī Raja Sinha who therefore showed favour to them. In the meantime, the relations between the Catholics and the Hollanders who in the peninsula had improved to such an extent, that the priest at Kalpitiya was not only allowed to get about his work freely, but was even regarded as a friend by the Dutch men. On February 15, 1796, Colombo was surrendered to the British by the Dutch Governor Van Angel Beck and from that date Dutch rule in Sri Lanka became extinct and on May 27, 1806 all disabilities and restrictions imposed by the Dutch on the Catholics were removed. An era of freedom, at long last dawned on the church. There are two traditional accounts of the origin of the shrine, both of them of sufficient importance to be enumerated. In the 17th century, a Portuguese man, in poor circumstances, travelled from Mannnar to Colombo to try and find a livelihood there, but failing to do so was returning by the coast, when he happened to fall asleep under a large tree which then grew at Talawila in the site of the present church. He dreamed that he saw an image at the foot of the tree, with lighted tapers burning on each side. Walking up from his sleep he received with astonishment that the image was actually there. In this confusion at this sudden and strange realization of the dream he prayed loud and while so occupied was suddenly dazed and awestruck by the 'great awakening light', which illumined the form of St. Anne herself. The mother of the Holy Virgin in bodily presence stood before him and told that the image he had seen was intended as a representation of herself and that he should build a church there, and name it after her, and preserve in it the relic that had so graciously been revealed to him. Deeply impressed with what he had witnessed the poor man set about building a small Chapel. St. Anne appeared to him again and left him some gold coins which enabled him shortly to return to his country where he raised funds for the construction of a permanent church at Talawila. He was, however, a third time favoured with a vision of the beautiful saint, upon whose instructions he built a larger one in its place. 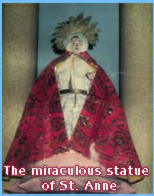 "The image" now exhibited in the church is said to be the identical statue discovered by the Portuguese man in the manner narrated here. The other traditional account of the origin is very popular though matter-of-fact. During the 18th century, an European trader was shipwrecked off the coast of Talawila. In those days, people living in the forests collected forest products such as elephant tusks, shins, horns, honey and wax and ebony and shipped off to the southern ports in sailing craft. It was one such trading craft that came to grief, off Talawila. As the vessel was dedicated to St. Anne and carried her image, the crew sought her protection and were saved. As the land offered them no shelter they looked around in distress and saw on a spot where the present church stands a large banyan tree whose cool shade seemed to beckon to them. After reverently placing the sacred image in a hollow of the tree, they rested. But, before they left, the Captain of the ship vowed to St. Anne that if his business prospered, he would revisit the spot and build a church, where he would place her image for veneration. As there was no hope of rescuing his vessel or its cargo he went back to Galle, where he had his home and his business. Some fishing craft from Kattaikadu saw the wreckage and made for it in the hope of securing the goods afloat on the shore. The news spread and more people came to the spot, which gradually acquired the name of Kappaladi, which, in Tamil means "the place of the shipwreck". From the shore they strayed on to a large banyan tree, probably to assess their finds under its cool shade. And what was their wonder, to see, in hollow of the tree, an image of St. Anne! Reports of favours granted spread all over the country and attracted many a pious Catholic. In the meantime the merchant from Galle prospered in business and revisited Talawila as vowed. He built a little Chapel and placed in it the venerable image and made a pilgrimage to the Chapel annually when business brought him to Kalpitiya. Some say that the banyan tree stood near a pool of water, from which the early pilgrim drank and which was later built into a well, subsequently known as the "Holy Well". In 1943, by some strange coincidence, exactly a hundred years after the erection of the present church, there appeared the hull of a wrecked vessel for which the present generation has no recollection whatever. The crowds of people who flocked to view it, in the pious belief that it was the vessel which had once borne the image of St. Anne, testify to the persistence off the tradition. The first repository of the venerated image of St. Anne was nature's handwork - the hollow of a banyan tree; then man made for it a cadjan shanty and very soon replaced it with a structure of daub and wattle. As the pilgrims increased a church of brick walls and tiled roof was erected. The 80-year old church, which stood in 1842 must have been of this description. With the dawn of the 19th century the fame of St. Anne's Church spread rapidly and in 1837 the foundation for a new church was laid by Fr. Pedro Caetano and in 1843 Fr. Pedro de Noronha completed the church. Fr. Froilano Oruna replaced him and introduced great changes to the church. The little Chapel dedicated to the Sacred Heart, where the Blessed Sacrament is revered with great honour was constructed in 1877. With all the modern conveniences for swift and comfortable travelling we now enjoy, it is difficult for us to imagine what our forefathers suffered on a pilgrimage to St. Anne's. For them it was altogether a penitential and prayerful progress. Whatever they come across a church, they would offer prayers and vows for the safety of their journey. At the shrine, their first visit was to the venerated image of St. Anne. With the construction of the bridges regular coach service and later a bus service was introduced. The journey from Chilaw to Puttalam which took three days in a bullock-cart, was done in seven hours by bullock coach, inn about half that time in horse coach and in three or even two hours by motor bus. In 1926, the first train ran to Puttalam and the journey to St. Anne's became easy, though it lost much of its romance. In 1950, a fine broad road, 16-feet wide was completed and opened to the public. In the sands of St. Anne's, the trammels of civilization and the artificial conventions of society are cast aside for plain living and simple thinking, religion begins to occupy its right place, which is the first place. The sense of Christian charity and Catholic solidarity begins to grow in the pilgrim's heart. The dear old church has been the scene of God's merciful love to His beloved children and His wonderful works on their behalf through the intercession of St. Anne, for 150 years. Our forefathers have knelt in it, prayed in it, and offered their supplications to God over the years. Here the Lord had regarded the prayer of His servants and their supplications. He has opened His eyes upon this house day and night, upon the place wherein. He has promised His name should be called upon. He has hardened to the progress of His people. Let us then commend ourselves, our homes and our Christian heritage, to the powerful protection of St. Anne. Let us glory in her patronage and with one voice thank God for all the favours, both spiritual and temporal, He has bestowed upon us through the intercession of St. Anne. 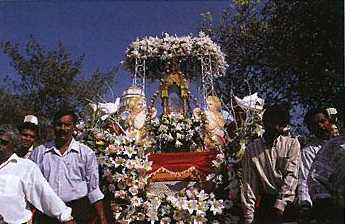 The image of St. Anne is carried in procession during the Feast of St. Joseph. On the second Sunday in March, the feast of St. Joseph is celebrated in the same manner, attended largely by fisherfolk of the western coastal areas, particularly Mutwal, as the calm seas of March have traditionally made this festival relatively easy for sailors to reach. For the Oru Mangalle, or Festival of Boats, as the feast has come to be known, more than 100 boats are drawn up on the beach, gaily decked with bunting. The fisherfolk stay on the beach in tents erected over or beside their boats. Joseph and Anusha, from Thoduwawe, and about thirty of their relatives, started out in three motorized boats early on Saturday, arriving about two and a half hours later. They shelter in a large tent beside the boats. Sunil and Mathias, from nearby Alankudawa, travelled only 15 minutes. There are others from Negombo and Chilaw, as well as the Colombo suburbs Mutwal and Modera. S.M. Joseph, who travelled with a large party of pilgrims from Modera, says they usually leave Modera at about 10 or 11 pm and travel through the night, arriving at Talawila at about 8 am. "We come about a week before the feast, carrying all we need in the boats," says Joseph. "The festival began with the flag hoisting on the first of March," reports Stanley Fernando, who has attended the Oru Mangalle 40 times in his 41 years. "As it is the season of Lent, we spend this time in prayer and Lenten observances, such as holy hours and the Way of the Cross." "There is a strong devotion to St. Anne in Sri Lanka, coming down from the French missionaries of Brittany," explains Bishop Frank Marcus Fernando. "We are trying to build halls to accommodate more pilgrims. And we're planting trees to shelter them from the heat." The bishop adds that, in the old days more than now, there was a strong sense of awe and austerity among the pilgrims -- a natural result of the hardships of the journey. Today, travelling by car to the feasts of Talawila is a pleasant excursion, the effort no longer a cross for the faithful to bear. But the reverence still shown by the pilgrims within the shrine of St. Anne's attests to its enduring sanctity. Source: Serendib Vol. 17 No. 4 July-August 1998, p. 25.